Crochet cozies are quick and easy to make and they can turn a boring mason jar into a festive centerpiece. Jar cozies are perfect for dressing up a jar for a birthday gift, creating mood lighting as luminaires’, and you can throw a few candy canes in the jar for a homemade gift. The inspiration for jar cozies is endless. With a little imagination, your mason jars can bring any holiday to life. Crochet potholders have been around forever; everyone remembers at least one grandmother and her crocheted potholders. Well, these potholders are not your grandmother’s potholders; no disrespect to granny, but these bright and colorful potholders look as great hanging on the wall as they do pulling out that delicious casserole from the oven! 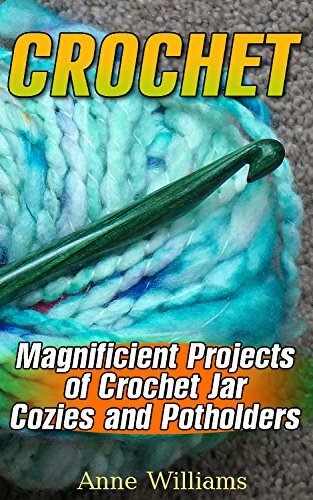 Download your E book "Crochet: Magnificient Projects of Crochet Jar Cozies and Potholders" by scrolling up and clicking "Buy Now with 1-Click" button!